Hopefully you have taken the time to read the other articles that tell the story of Howie Wing and how I came into the search for information, particularly Kathy Hammel's wonderfully descriptive article. Now you know why Kathy is the Queen of Howie Wing. 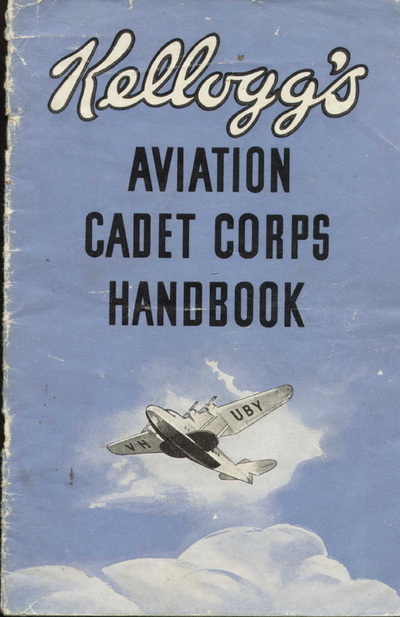 This section will just be dealing with the Howie Wing Cadet Corps in Australia and what we now know. This should bring the Australian story up to date, so if you know something not mentioned here, or you think I have missed something or made a mistake, please, let me know. There are people waiting to hear and they get very excited about new information. The request for information on Howie Wing in Australia started in 2005. Back then we had no online newspaper archive such as the National Library of Australia's Trove project. Any searches for information had to be made in person in either a State Library or similar institution, word of mouth (we made use of email) between other Australian collectors and researchers, or our own collections of Newspapers and Radio Magazines. As you can see in our resources section, we do have a lot of radio newspapers and radio magazines and the bulk of those in my personal collection. When Kathy Hammel contacted me 31st March 2005 I simply sent an email out to the members of the australianotr group and the next day I was able to confirm to Kathy that Howie Wing was broadcast in Australia, thanks to the work of the late Moris Sztajer who had already noted the series as a U.S. series when researching for our database. That kicked off the next 8 years of collecting information on Howie Wing whenever we visited 1938-1940 or added another magazine from that period to our collection. Howie Wing is the name of the main character in a Juvenile Radio Show made in the United States. It dramatizes the story of a cadet, training to become a pilot and then after graduation. Howie has his group of friends and a group of antagonists. He also has a mentor in Captain Harvey. That is the very basic story. 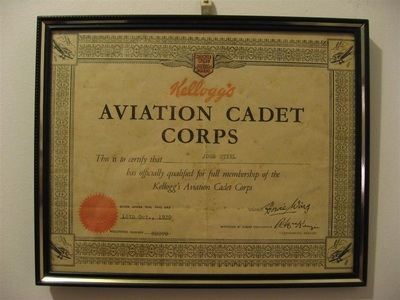 The show, via its sponsor Kelloggs, then reached out to its audience of boys and girls (and parents, there is good reason why the show was broadcast as late as 8.30pm, adults loved it too) by having the children join the Howie Wing Cadet Club. Usual payment of Kelloggs box tops to prove you are eating the sponsors products and you send away for your membership. 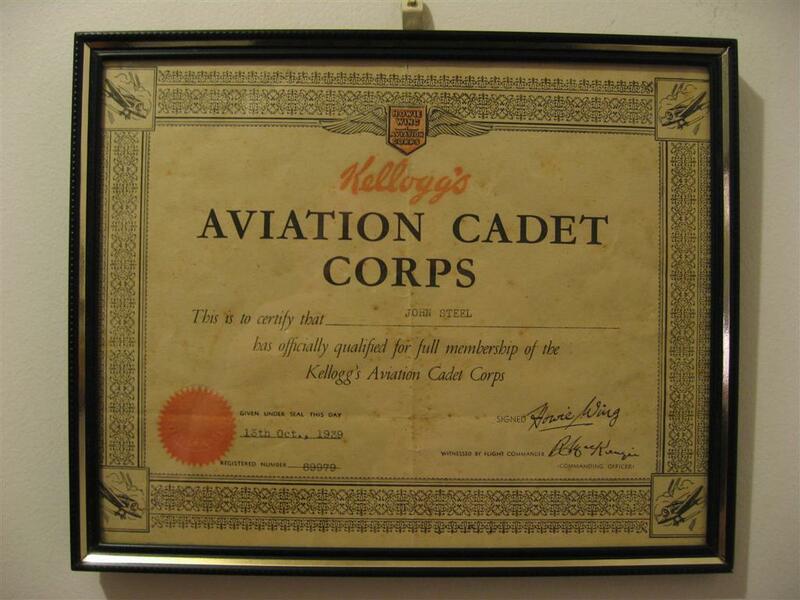 You received a letter of confirmation, a certificate, a manual which contained the rules, more items to purchase with box tops and money, information on becoming a pilot or for girls, a Stewardess. Last but not least, the membership badge. Howie Wing was a household name thanks to the radio show and the Cadet Club. The name was everywhere and very popular. I know I got a shock when I read one snippet of news on an online newspaper site, that Howie Wing had been gelded. Then I realised someone had called their race horse after the show as well. Then a greyhound had the name and even kids used it as a nickname in other clubs. It certain made the research more entertaining. We were able to confirm that Howie Wing was introduced to Australia by Grace Gibson http://adb.anu.edu.au/biography/gibson-grace-isabel-12534 who had imported the series on 16" Transcription discs (big LPs) before the ban on imported goods. Unfortunately, we have not been able to locate any of these discs. 2CH Sydney, commencing 1938 and finished January 1940. It was Broadcast in all states on many different stations. The show was very popular, not just with the kids and listener numbers were very high and very strong. Unfortunately Bill Moore, the person who came up with the series and wrote all the episodes, passed away whilst he was checking locations and ideas for series three and the show was ended. I guess one of the things that would be a surprise to people who know me in the Old Time Radio hobby, is that I am spending so much time on a U.S. series. Researching Australian shows keeps me busy but I think I am attracted to the sense of community that was present with the Howie Wing Cadet Club. There was a lot more to Howie Wing than passive listening and that really appeals to me. I have a large collection of Radio Club memorabilia, particularly the club badges and no other Australian Radio Club had the range of 'Premiums' or collectable items associated with the club. The Argonauts would be a bigger club and had more interaction with the members and there were other clubs bigger than Howie Wing in later years, but Howie Wing is hard to beat and in the same years, it really had no competition. 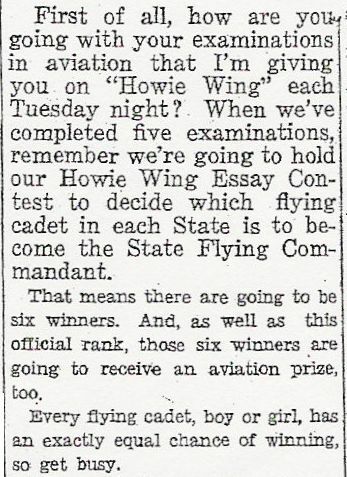 Over 90,000 children were members of the Howie Wing Aviation Cadets. Kellogg's was on a winner. You have to think of the time period of 1938 to 1940. Aeroplanes were a new frontier and for the children of the time, the idea of actually flying was very exciting. Very few would ever have experienced flying or even expected to, sort of like a kid in the 1950's dreaming about space travel. Australian kids saw a lot more Aeroplanes at this time because of WWII and they would have had family members involved in the war in one way or another. Their chances of knowing someone involved in flight was a lot higher in the period of Howie Wing and they would also have heard Radio reports and heard newspaper comments involving war news and aircraft. Everybody followed news of the ACES. 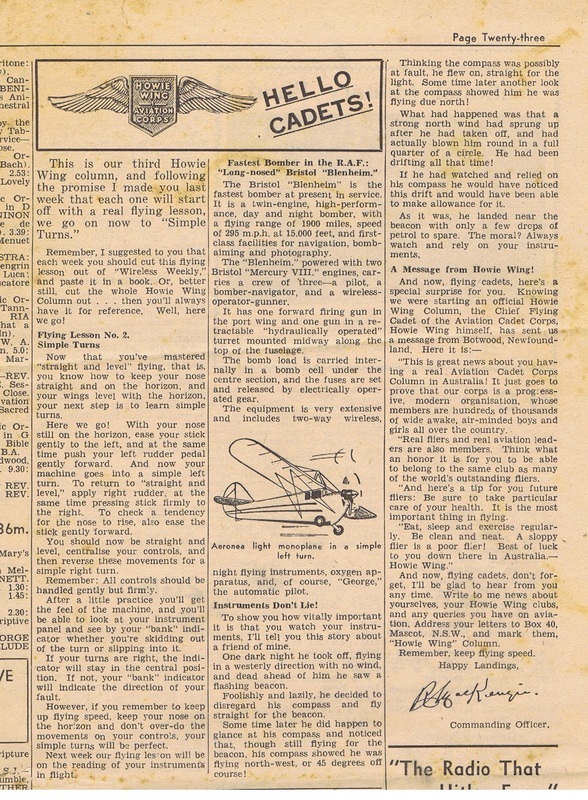 A national weekly radio magazine 'Wireless Weekly' was chosen as the means of passing on club news, as well as 'Flying Lessons'. WWI flying Ace, Flight Lieutenant Robert McKenzie was chosen to be the Australian Commander of the Howie Wing Cadets. At this stage we still don't know why Robert McKenzie, or how he was chosen, but by all accounts he carried out the position well. I did track his later life, but unfortunately he was killed in a boating accident and his wife also passed away several years later. They had no children that I could track, perhaps they had siblings or other close family who may be able to fill the gaps in our information. Howie Wing model aeroplane clubs sprang up in the hundreds. I have a Howie Wing balsa wood aeroplane kit and the plans to make it. I have no idea how the kids did it, I doubt I could without assistance. I grew up with airfix kits and the parts were already moulded and just needed assembly and some glue. These kits have the plans and you cut out the parts just like dressmaking patterns. You will get your chance as I am going to have my plans available in a pdf for you to print out and lets see how many of you actually make a Howie Wing plane. I will include the stickers images that you can print out and glue on. I see that toy stores still sell the balsa. I challenge you! I will have to come up with a prize if a few of you take up the challenge. You can use our online form to request the plans and I will email them to you. Above is the double sided medallion, a very popular premium in Australia as well as the U.S. I have also included a scan of the Model plan, the label of the box it came in as well as the Kellogg's stickers for the model. You can see how complicated it is, full size it is about A3. There are other premiums which were not available in Australia and so I will include them now in the next slideshow. The contest consisted of writing a essay and answering questions on all aspects of flying and was run by the radio station in conjunction with sponsor. Only one trophy was awarded in each state of Australia. The year it was awarded was in 1936 but i think it was awarded in 1938." He also included a picture! Excuse my rough attempts to remove the background, but you get the idea of what the trophy looks like. Lindsay also included a ruler in the photo and the trophy looks to stand about 16" or 40cm high. A decent sized prize for sure. As you can image, the emails flew back and forward as we followed up on this, unsure initially if it was a hoax or not. The Kellogg Archivist in the U.S. reported that they knew nothing about a National Essay competition held in Australia. Then the first clue was found under our nose in Flying Lesson number 3 which was printed in the Wireless Weekly magazine 1939-11-04 which still doesn't jell with either year mentioned by 'Lindsay'. But we were now on the right track and I found another clue in the Teleradio magazine 1939-11-26. Teleradio, a Queensland Radio Magazine, also ran the Howie Wing Flying Lessons. Sadly, despite a lot of searching, both in online newspaper archives and my own extensive newspaper/radio magazine collection, I have not been able to find any further details on the Essay competition nor the winners. 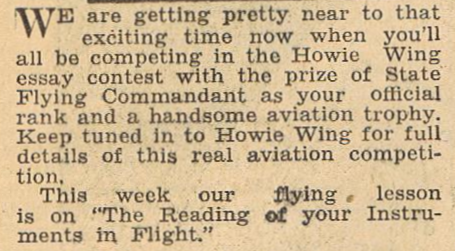 I have all the Flying Lessons through to the final one 1940-02-10 but no further mention of the competition is included. Its just one more Howie Wing mystery we still need to solve. But thank you 'Lindsay' for bringing the trophy to our attention. Kathy in her article mentioned the assistance given by Kelloggs collector Tony Austin. He was a fountain of information and jumped right in and sent me photocopies of Flying Lessons, he sent me a badge and medallion, he really was amazing. I have lost his email information, so if you read this Tony, I have some items here for you and a CD full of our finds from Kathy. I joined the radio serial corps in October 1939 and given the registered number of 89979 and listened to the serial on radio 2CH several nights a week. Like many boys at the time, I was eight years old, aeroplane mad, making balsa wood models from kits. I can’t recall any from Kelloggs, but it is very likely some came from their catalogue in the Club’s handbook. We were all issued with a badge, mine now sadly lost, and I proudly wore this on my school clothes. Vaguely I remember the episodes, but not in any detail. Only a couple of years later my cousins were flying spitfires and Lancaster bombers in the UK and my father later joined the RAAF, too. My membership number indicates a large number of members but this may not be a true count of the membership. This and other radio serials deserve to be researched as you say may have inspired many to take up flying. To hear an episode would be wonderful and this radio club later inspired me to take the “Aeroplane and Flight” the U.K. Magazines when I was older. I don’t know when the serial commenced or finished though I am sure your researcher will find this. I am hoping through my appeal for former members in the RSVP Herald columns many may come forward to have a re-union. I expect you know of the book “out of the Bakelite box” by Jacqueline Kent published by the Australian Broadcasting Commission re- issued, 1990. This book tells of the radio period at its peak and the serials that were broadcast at that time. I will keep in touch Ian. John also supplied a photo of his membership certificate, which you will see that I have used earlier in this article, even though I have other examples. Kathy and I still search for Howie Wing related items and email regularly about our finds. Kathy has been collecting the scripts from archives and putting them together to make the story. The Kelloggs archivist also keeps in contact with her. We have permissions from the Library of Congress to use recordings we sourced from them but we cannot make them available. We have agreements with J Walter Thompson Advertising to use material. We have agreements with other Archives as well and we are bound by them as to what we can make available, particularly the actual episodes we have found in their Archives. We have hundreds of articles and items not displayed here due to space restrictions. I have tried to use slideshows to display numerous items just to get them to fit without taking over the whole website. 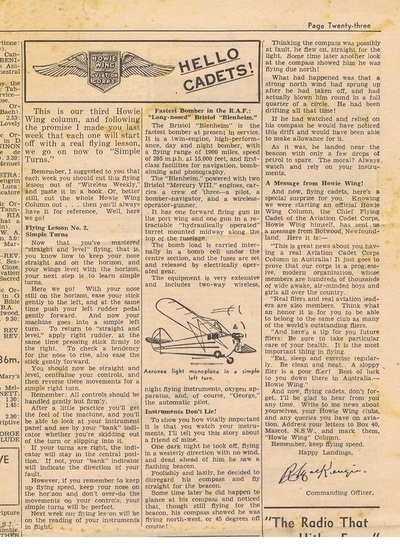 But you can see that the amount of material available for the Howie Wing Cadet Club is far in excess of any other Radio Club, probably most of the clubs combined. As you will gather from reading Kathy's article, we have more questions to answer. In regard to Australia, it is identifying which series we received. We do that by matching episode descriptions from newspaper articles to scripts Kathy has been gathering. The big question for Australia is where are the Transcription Discs?, if in fact, any do survive. I will continue to update this page as we find more information. I hope that soon I will be able to add audio found in Australia. If you have any information on this series or any other, please contact me using the contact form on this site.